The United States Antarctic Program (or USAP; formerly known as the United States Antarctic Research Program or USARP and the United States Antarctic Service or USAS) is an organization of the United States government which has presence in the continent of Antarctica. Founded in 1959, the USAP manages all U.S. scientific research and related logistics in Antarctica as well as aboard ships in the Southern Ocean. ... to understand the Antarctic and its associated ecosystems; to understand the region's effects on, and responses to, global processes such as climate; and to use Antarctica's unique features for scientific research that cannot be done as well elsewhere. A Boeing C-17 Globemaster III servicing the United States Antarctic Program at Christchurch International Airport, Christchurch, New Zealand. The U.S. Antarctic Program, funded by the National Science Foundation's Office of Polar Programs, supports only research that can be done exclusively in Antarctica or that can be done best from Antarctica. The scientific disciplines encompassed by the USAP are astronomy, atmospheric sciences, biology, earth science, environmental science, geology, glaciology, marine biology, oceanography, and geophysics. Currently, the USAP maintains three year-round research stations in Antarctica, the McMurdo Station, the Amundsen–Scott South Pole Station, and the Palmer Station. In addition, the USAP operates several summer research camps and several research vessels that sail in the Antarctic waters. The program's fiscal budget for 2008 was US$295 million, and for 2012 was US$350 million. ^ a b c "Fact Sheet: U.S. Antarctic Program". USAP. National Science Foundation. January 10, 2013. Retrieved July 11, 2016. ^ "2009-2010 Season Summary and Background" (PDF). USAP. National Science Foundation. January 8, 2010. p. 24. Retrieved July 11, 2016. ^ a b "Antarctic Research nsf08535". National Science Foundation. January 16, 2008. Retrieved September 5, 2010. ^ "United States Antarctic Program". Retrieved September 5, 2010. ^ "U.S. Antarctic Program". Fact Sheet. The National Science Foundation. December 29, 2008. Retrieved September 5, 2010. ^ "U.S. Antarctic Program". Fact Sheet. The National Science Foundation. January 10, 2013. Retrieved February 8, 2015. 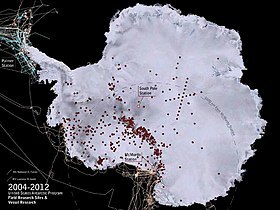 Wikimedia Commons has media related to United States Antarctic Program.